New Jersey has a long history of arguments of pork roll versus Taylor Ham, hoagie versus sub (it’s a sub), and most importantly, where to find the best pizza. The secret answer is: There’s great pizza all over the state. From Sicilian pies to thin crusts, there is a style and location for every type of pizza you want to try, whether brick oven or wood-burning. South Jersey is known for tomato pies, North Jersey has thin crust, and central Jersey has a little bit of everything. Some joints offer creative pies and toppings while older veteran pizzerias offer a classic margarita pie. 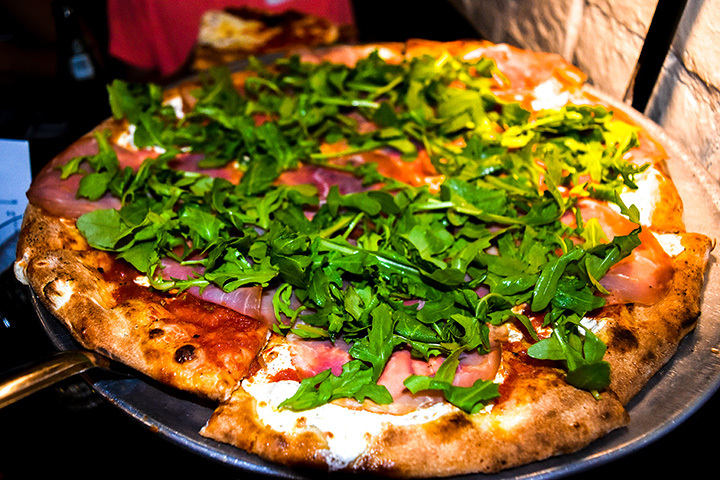 Whatever your favorite pizza is, these 10 pizza restaurants in New Jersey will surely satisfy. Whether you have the drinking munchies or want to just grab a slice for lunch, Tony’s creative pizza names and toppings will have something to hit the spot when you need it most. Their mac and cheese pizza and general tso’s toppings are incredible and combine two of your favorite foods into one. Slices are huge too which is always a nice bonus. This long established location sits not far from the beach serving up thin crust pies in a casual sit-down joint. Try their plain pie or any of their subs for a satisfying meal. You can also join their Whole Pie Eater’s club and win a t-shirt if you finish a pie by yourself in one sitting. With a long family history, Star Tavern takes the trophy for thin-crust pizza. Upon walking in, it can feel like a busy sports bar but one bite of their margarita pie will take you to a whole other place. The busy setting adds to the experience as you realize a lot of regulars and families frequent the place. Brooklyn Boys serves up simple, authentic Italian classics like subs, pizza, calzones and stromboli. It’s tucked away in a shopping plaza but the food stands out. Once you walk in and smell the sauce, you’ll know you picked the right place. This kooky outlandish looking spot makes one of South Jersey’s best tomato pies, a pie with crushed tomatoes, fresh garlic and mozzarella drizzled with an old blend on a thin crust. Arturo’s applies the farm to table concept to their pies by sourcing food from local farmers and artisans. Located near Maplewood’s charming downtown, their small kitchen puts time and effort into the pies. Only walk-ins are available. Nomad is a cash-only, bustling pizza spot that keeps their ingredient local, fresh, and organic. Select your fresh toppings, including meat and vegetables, which are then baked in their wood-burning brick oven. They do not take reservations but are BYOB. This family-owned restaurant uses a brick oven to make their fresh pizzas with a tomato sauce recipe passed down through the family. Menu options include seafood, pasta, paninis, and pizza of course. Gluten-free options are available. Started in 1947, De Lorenzo has since moved from their original spot for a fresh new look. They serve salads, antipasti, and of course tomato pies with toppings of your choice. Stop by for an authentic tomato pie.